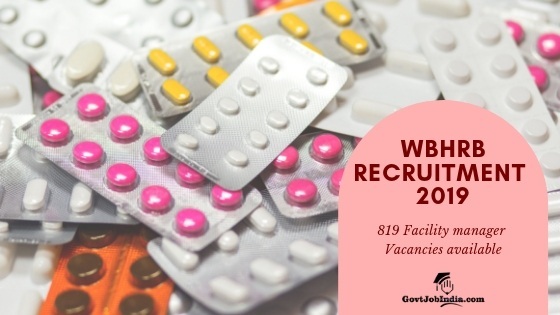 WBHRB Facility Manager Recruitment 2019: Job seekers within the state of West Bengal are notified that the West Bengal Health Recruitment Board has released the WBHRB Facility Manager Recruitment 2019. All candidates who are interested in pursuing a career in the West Bengal Health department are requested that they kindly send in their duly filled online application form before the final date on 25th February 2019. The WBHRB are inviting applications from all over the state of West Bengal. This makes this the ideal opportunity for you to get yourself a high paying Govt job in West Bengal. Don’t miss out on this opportunity which can be availed by all the candidates who have the minimum qualification of graduation. All the details regarding the roles of the facility manager and the facility manager salary, eligibility criteria and application form details have been provided right here. So make sure that you go through this page once before you start applying online for the WBHRB Facility Manager Recruitment 2019. Kindly read through the page and make sure that you are eligible for the aforementioned poss in the WNHRB. Candidates are requested to send their fees through GRPS ( Govt. Receipt Portal System ), Govt. of West Bengal under the Head of Account ‘0051-00-104-002-16’. The application fee scheme of the WBHRB facility manager recruitment if provided below. For any reservation related fee issue, kindly visit the official website of the WBHRB and check out their reservation policies. How to apply for WBHRB Facility Manager Recruitment? Candidates can submit their WBHRB Facility Manager Online Application Form Online on their official website. The steps enlisted below will make the application process much simpler. Candidates must first visit the official website of WBHRB @ wbhrb.in. Once on the website, you must proceed to the Recruitment section. Candidates are first needed to Sign Up on the website of the WBHRB. Signing up will provide the candidates with a registration id and password. Candidates can then select the WBHRB Facility Manager Recruitment Application Form and use the Registration ID and Password to start their online application process. Fill the WBHRB Facility Manager Application Form carefully and proceed to the Application Fee submission. Once you have paid the application fee, make a copy of the E receipt. We hope that you are able to apply online in time for this fabulous opportunity provided by the WBHRB. Kindly make sure that you send in your applications before the last date on 25th February. If you have any doubts then feel free to ask us in the comment section below. We will get back to you with solutions as soon as we can. All the best!